Check to see if your jar is properly sealed. The lid should not flex at all. If it does, you need to refrigerate the contents and use them straight away. You can decant them in to a sterilized glass jar if you wish. If the jar has sealed properly you can remove the band and store the preserves in your pantry for up to one year. Remember to label the jars with the date! Next year we should be getting a massive crop of plums, so I will definitely be making plum sauce. Yours sounds delicious! I love Chinese 5 spice so anytime I get to use it in a recipe I get excited 🙂 Yum! I love savory sauces made of fruits! This plum sauce should go so well with any meat dish! Great detailed tips on jar, I usually get intimidated too. And yeah this sounds awesome on duck! I absolutely love the idea of using this plum sauce on vegetable stir fries and a million other uses as well. Maybe even on chicken? I wonder how it would taste. I find it so satisfying to make a large batch and then give jars to friends. I will have to try this recipe! Looks so GOOD! I like the sound of this sauce. Plums are just about to come into season here so once they come down in price, I’ll come back and have a go. It is an interesting idea, I like to add sauce to a meat but I never made one. Yum!! This looks delicious! What a great recipe to add some fun flavor to your meals! Thanks for sharing Tandy! Never thought to make this myself – looks and sounds delicious and will be giving this a go myself! Yum! 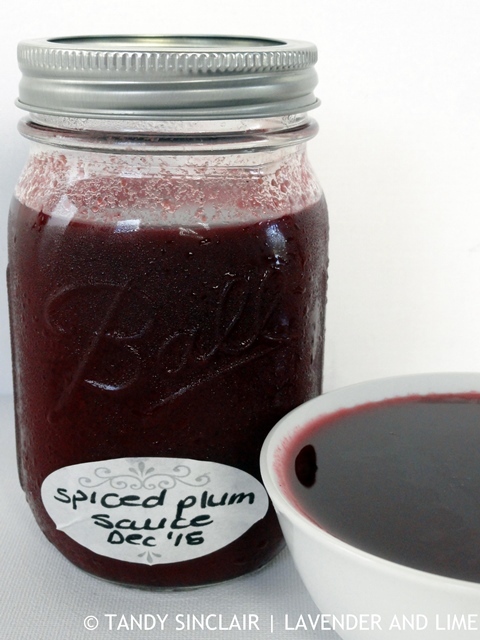 This spiced plum sauce sounds amazing.